For many decades the Russian Orthodox Church took and continues to take an active part in the preparation of the Holy and Great Council of the Orthodox Church. Since the 1st Pan-Orthodox Conference in 1961 on Rhodes, the outstanding hierarchs and the best theologians of our Church have made their contribution to the work on a great number of the Council’s topics, including those which were not to be included later in the agenda of the Holy and Great Council. For the sake of the earliest convocation of the Council, the Russian Orthodox Church has repeatedly re-affirmed her readiness to achieve decisions mutually acceptable for all the participants in the pre-Council process, even if such decisions diverted from the already agreed rules of the Council’s preparation. However, the principle of pan-Orthodox consensus has been the invariable basis of the pre-Council process beginning from the 1961 Rhodes Conference, which, on the initiative of the Patriarch of Constantinople, resolved the following: “The decisions of joint meetings shall be adopted with the full unanimity of the delegations of the Churches” (The Procedure for the Function and Work of the Rhodes Pan-Orthodox Conference, Par. 14). Later this rule was fixed in the Rules of Procedure of Pan-Orthodox Pre-Council Conferences adopted in 1986 as follows: “The texts on all the agenda items of the Pan-Orthodox Pre-Council Conferences shall be approved unanimously” (Article 16). The 2014 Synaxis of the Primate of Orthodox Churches re-affirmed the following: “All the decisions made both during the Council and the preparatory stages shall be made on the basis of consensus” (The Decision of the Synaxis of the Primates, Par. 2a). The same principle was established in the Working Procedure of the Holy and Great Council of the Orthodox Church, which has been developed by the Synaxis of the Primates of Orthodox Churches, which took place on January 21-28, 2016, in Chambesy. This Procedure provides, among other things, that the Council “shall be convened by His Holiness the Ecumenical Patriarch with the consent of their Beatitudes the Primates of all the universally recognized Local autocephalous Orthodox Churches (Article 1). The same Synaxis approved by a majority vote the decision to convene the Holy and Great Council of the Orthodox Church from June 18 to 27, 2016, in Crete. However, this decision, just as the Working Procedure of the Council and the Council’s draft document on “The Sacrament of Marriage and Impediments to It” was not signed by the Orthodox Church of Antioch. The latter was not signed by the delegation of the Georgian Orthodox Church either. The both Churches pointed out to serious reasons for their decision. Nevertheless, the Russian Orthodox Church, for the sake of success in the progress towards the convocation of the Council, deemed it possible to sign the above-mentioned documents, expressing, at the same time both at the Synaxis itself and in the correspondence with His Holiness Patriarch Bartholomew of Constantinople, her conviction of the need to make intensive efforts in the time remaining till the Council (including by the Pan-Orthodox Secretariat established by the Synaxis) for seeking a general Orthodox accord with regard to the documents not signed by the two or one of the Local Churches, which would make the convocation of the Council possible. For reasons beyond the control of the Russian Orthodox Church, no further pan-Orthodox discussion on the existing situation was undertaken. The Bishops’ Council of the Russian Orthodox Church, which took place on February 2-3, 2016, approved the position taken by the Russian Orthodox Church delegation at the Chambesy Synaxis and in other pan-Orthodox bodies, expressed its satisfaction with the introduction of the necessary amendments and additions to the Holy and Great Council’s draft documents and having them preliminarily approved on the whole, charged the Holy Synod with forming a delegation of the Russian Orthodox Church to the Pan-Orthodox Council, which was done by the Holy Synod in April 2016. The Bishops’ Council called upon the plenitude of the Russian Orthodox Church ‘to lift up an ardent prayer that the Lord may reveal His will to the members of the forthcoming Holy and Great Council of the Orthodox Church and that it may fortify the unity of Orthodoxy and serve to the good of the Church of Christ and the glory of God and preserve the Orthodox faith intact’. At the same time, the Bishops’ Council expressed ‘the conviction that the free participation of the delegations of all the universally recognized autocephalous Orthodox Churches in the Pan-Orthodox Council is a necessary condition for holding it’, noting that ‘in this connection, the solution of the problem that has arisen in relations between the Patriarchates of Antioch and Jerusalem is of special importance’ (Resolutions, Par 6). In the hope that a pan-Orthodox accord will be achieved since without it the convocation of the Holy and Great Council is impossible, the Russian Orthodox Church immediately appointed her representatives to the bodies responsible for its further preparation and, using all possible opportunities she had for personal contacts and correspondence, took an active part in the pre-Council process. At the same time, the work was carried out to examine critical remarks to the Council’s draft documents coming from the episcopate, clergy and laity and published following the Chambesy Synaxis at the initiative of the Russian Orthodox Church. These comments, often accompanied with criticism with regard to the process of preparations for the Council, were also expressed in many other Local Orthodox Churches. Separating constructive remarks from unfounded criticism with regard to the forthcoming Council and its documents, the Department for External Church Relations came out with explanations and comments responding to the confusions arising in the flock. 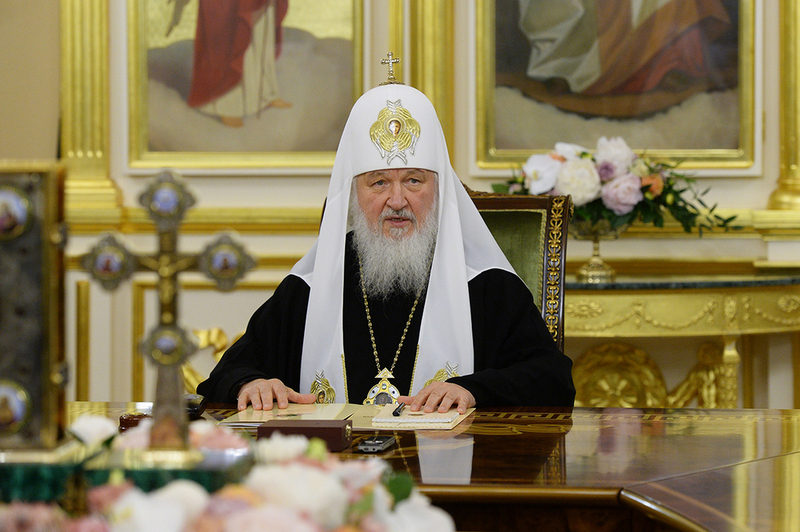 On June 3, 2016, the Holy Synod of the Russian Orthodox Church looked closely into the proposals, which had come from the episcopate, clergy, monastics and laity, and approved the Russian Orthodox Church’s amendments to the Pan-Orthodox Council’s draft documents on ‘Relations of the Orthodox Church with the Rest of the Christian World’ and “Mission of the Orthodox Church in Today’s World’. At the same session, the Holy Synod noted that essential amendments to the Council’s draft documents were to a great extent consonant with those presented by the Georgian, Serbian, Bulgarian and Greek Orthodox Churches, as well as the Holy Kinot of Holy Mount Athos, and these amendments need to be thoroughly examined with the aim to find pan-Orthodox consensus necessary for the Council to take decisions. These circumstances, as well as the concurrent ‘uncertainty as to the possibility for the Patriarchate of Antioch to attend the Holy and Great Council, just as the absence of a preliminary consensus on the Council’s Working Procedure and the document on ‘The Sacrament of Marriage and Impediments to It’ compelled the Holy Synod to recognize the need for urgent pan-Orthodox actions and to propose that His Holiness Patriarch Bartholomew of Constantinople convene no later than the 10th of June an extraordinary Pan-Orthodox Pre-Council Conference to consider the situation and search for a way out of the existing extraordinary situation so that as a result of this conference the Orthodox Church could make a judgement as to the possibility for holding the Pan-Orthodox Council at the planned date. By the decision of the Holy Synod, this proposal was immediately sent to His Holiness Patriarch Bartholomew of Constantinople and to all the Primates of Local Orthodox Churches. Attached to the reply was a notice about the extraordinary session of the Patriarchate of Constantinople Holy Synod, which took place on June 6 with the participation of bishops coming to Constantinople. It states that ‘the Holy Synod with astonishment and bewilderment heard the recently voiced positions and opinions of a number of fraternal Orthodox Churches and stated that a review of the Council’s planned process goes beyond all the institutional bounds’. At the same time, the date of the convocation of the Council is referred to as established by a pan-Orthodox decision, though, as was pointed out above, this decision was not signed by the Church of Antioch. To appeal to His All-Holiness the Ecumenical Patriarch, in the time separating us from the date of the convocation of this Council, to exert more efforts to achieve consensus for settling all the concerns expressed by Orthodox autocephalous Churches with regard to the Holy and Great Council. If the efforts to achieve consensus are failed, then the Church of Antioch asks to postpone the convocation of the Holy and Great Council to a later date when peaceful relations prevail among all the autocephalous Churches and Orthodox consensus is achieved with regard to the Council’s issues, its Rules and organization procedure. The Patriarchate of Antioch will not take part in the Holy and Great Council until all the reasons impeding its participation in the Divine Liturgy in the course of the Council are removed, when a final solution is found to the problem of the Patriarchate of Jerusalem’s invasion in the territory of the Patriarchate of Antioch, which has led to the discontinuance of communion with the Patriarchate of Jerusalem. To re-affirm the importance of participation of all the Orthodox autocephalous Churches in the Holy and Great Council and their decision-making on the basis of general consensus with the aim to preserve the unity of the Orthodox Universal Church. To address all the Orthodox Churches, notifying them of the position taken by the Church of Antioch with an explanation of all the reasons that has led to this position. Thus, four Local Orthodox Churches (those of Antioch, Georgia, Serbia and Bulgaria) expressed the opinion that it is necessary to postpone the Council, with three of them (those of Antioch, Georgia and Bulgaria) refused to participate in the Council set for June 18-26, while the proposal of the Russian Orthodox Church to convene an extraordinary Pan-Orthodox Pre-Council Conference was not accepted by the Synod of the Patriarchate of Constantinople. In this situation, the necessary ground for convening a Holy and Great Council – which lies in the existing ‘consent of their Beatitudes the Primates of all the universally recognized Local autocephalous Orthodox Churches’ (Organizational and Working Procedure of the Holy and Great Council of the Orthodox Church, Article 1) – is obviously absent. The only possible decision in this case is to continue the preparation of the Holy and Great Council with the subsequent achievement of pan-Orthodox consent to its convocation at a different date. to consider it desirable that, taking into account the proposals expressed in many Local Orthodox Churches, the future Council could be attended by all the hierarchs of the Holy Churches of God without restrictions, since it will certainly enhance the authority of the decisions made by the Council. ‘The name of the Church is not that of division, but unity and harmony’ teaches St. John Chrysostom (Homily on First Corinthians, 1,1). In the name of harmony and unanimity we are to listen ‘what the Spirit says to the churches’ (Rev. 2:7) in the spirit of condescension and brotherly love, without mutual reproaches and inflicting new wounds on the divine-human Body of the Church, listening to one another and especially to the Divine Revelation sealed in Holy Scriptures and the Holy Tradition, and to draw the necessary lessons for the mistake we made for the reason of our human weakness, which were made in the course of the current preparations for the Holy and Great Council, so that with Godspeed we may achieve the unimpeded accomplishment of this great event to the glory of God and the good of the Orthodox Church. The Holy Synod calls again upon the episcopate, clergy, monastics and laity of the Russian Orthodox Church to lift up a fervent prayer that our Lord Jesus Christ may reveal His almighty help and His holy will in this pursuit.